Hatch at least one FROG (fluid resonance oracle gnosis) per week. Follow instructions below, post answers for A-C only. Note: “Pseudo” Random Number Generators (PRNGs) produce a sequence of numbers using a method (usually a software algorithm) which is predetermined and therefore, in theory, predictable. However the algorithm is sufficiently complex to prevent the sequence being predicted unless an initial “seed” value is known. PNRGs use various unpredictable ways to seed the algorithm, such as ambient temperature or stock market fluctuations. A common seed is the computer’s system clock time at the moment when the generation begins. 2. Find your three analogues in The Complete HATCHERY. 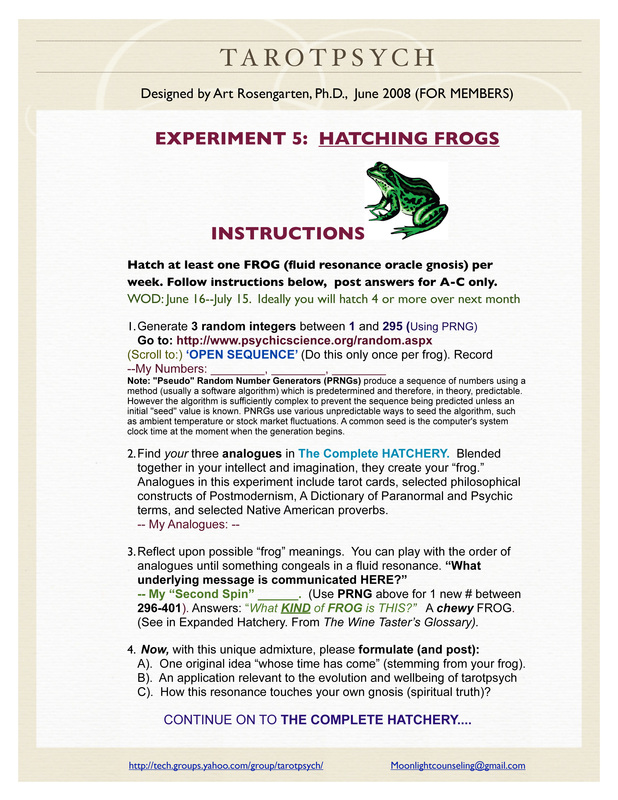 Blended together in your intellect and imagination, they create your “frog.” Analogues in this experiment include tarot cards, selected philosophical constructs of Postmodernism, A Dictionary of Paranormal and Psychic terms, and selected Native American proverbs. Expanded: “Second Spin” ______. Supplies taste or nuance to frog. (Use PRNG above for 1 new # between 296-401). Answers: “What KIND of FROG is THIS?” Answer: A chewy FROG. (See in Expanded Hatchery. From The Wine Taster’s Glossary). A). One original idea “whose time has come” (stemming from your frog). C). How this resonance touches your own gnosis (spiritual truth)?